82 point RAC check, Service History, Air Conditioning, Alloy Wheels, ABS, Electric Windows, Electric Mirrors, Remote Key Locking, Rear Wash Wipe, Colour Coded Bumpers, Colour Coded Mirrors, Front Fog Lamps, Radio, Low tax / Insurance, Ideal First Car, High level brake light, Passenger Airbag, Spoiler, Privacy Glass, Alarm, Cruise Control, Bluetooth, DNA Switch, RAC and Trading Standards APPROVED, Nil Road Tax, Bose Speaker System, Normal Driving Mode, All Weather Driving Mode, Dynamic Driving Mode, Leather Steering Wheel, FINANCE AVAILABLE. HPI CHECKED. 6 months RAC warranty FREE; 24 mts available. P/X WELCOME,,MK Car Sales are delighted to offer for sale this 2014 Alfa Romeo MITO Live Twinair. Finished in Wicked Red with a Charcoal interior. This car benefits from Bluetooth, Alloy Wheels and Air Conditioning.We offer a complimentary 6 month RAC warranty and 82 point RAC pre-sale inspection with all of our cars. 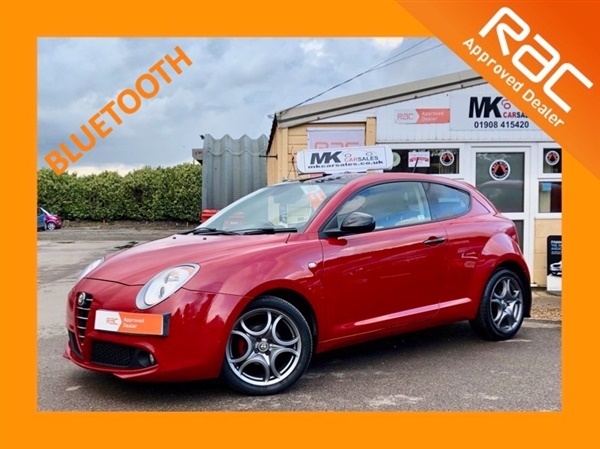 This advert is for an Alfa Romeo Mito, click Alfa Romeo Mito in Milton Keynes to see more cars like this in the local area. Want to search further afield? Click Alfa Romeo Mito in Buckinghamshire to search for similar cars in the wider Buckinghamshire area.